Flatchestedmama creates time-based and conceptual works. She was a founding member of the all-girl, adult double dutch performance troupe, OntheDouble (2003 ~ 2010), and she likes sending and receiving snail mail. The artist had an early introduction to the mispronunciation and misspelling of her last name, Trefsger, via the media attention she received from running (really fast) in high school. Due to that experience, when starting her budding art career, she decided to use a moniker and chose Flatchestedmama. She found it humorous, empowering and catchy. The name Flatchestedmama was legally integrated into her birth name in conjunction with her Commitment Ceremony where she made a Public Declaration of Commitment to Her Creative Self. The act of legally adopting her artist moniker helped make her “commitment to creativity” official by adding some bureaucracy to it. 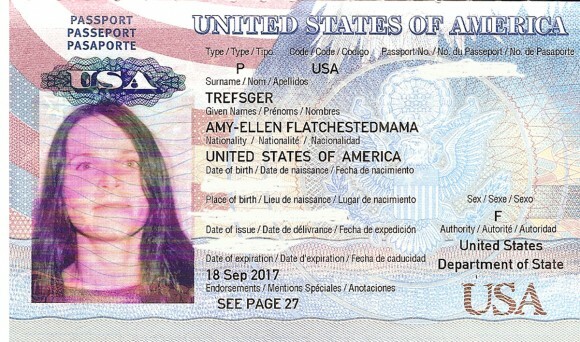 The IRS and her grandmother (now passed) write letters to Amy-Ellen Flatchestedmama Trefsger. Word to her Grandma. While for many all the world is a stage, for Seattle-based artist, Amy-Ellen Flatchestedmama Trefsger, all the world is a carnival. And she positions herself as one of the central figures in all the gleeful performance. Big bursts of colors, wonderful worlds of whimsy and shocks of introspection are signature to the conceptual artist, known perhaps most famously for herPublic Declaration of Commitment to Her Creative Self. On September 18, 2004 Amy-Ellen wed her artistry, until death do them part. The culmination of nine months of preparation, the ceremonial event featured a white dress; poetry from beloved Emerald City writers, Karen Finneyfrock and Maged Zaher; a cake made from cement; and her father, who’d flown in from Pennsylvania, walking the artist down the aisle. Since, she’s been dutifully creating, embodying an eager spirit, generous with methods to display ponderous joy. Other standout projects include Amy-Ellen’s time-based works like 100 HOURS IN A LIFE JACKET, during which wore a life jacket for 100 hours straight (taking only one bath); DESTINATION: COUNTRY VILLAGE, a nine-day residency in a country themed shopping village; and SHARING MY SUBCONSCIOUS, a 52-week dream vlog. Conceptual works include a collection of Santa photos and a question and answer booth on performance art. Truly, Amy-Ellen is a figure unto her own in a city rich with them. Above images L to R: Smurfette, Urban Beach Scene by Flatchestedmama image ©Adam Weintraub 2006, TMJ: All The Gum I chewed in December 2010 by Flatchestedamama, Monochromatic May self-portrait in 2007, misc. self portrait.